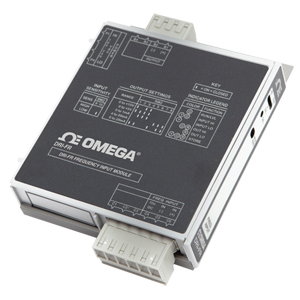 The input of the DRI-FR can be configured for any frequency span from 2 to 10,000 Hz. The input amplitude threshold sensitivity can be adjusted from 150 mV to 150 V rms to ensure accurate frequency measurement and minimize transient noise related errors. The output can be set for either 0 to 5V, 0 to 10V, 0 to 1 mA, 0 to 20 mA or 4 to 20 mA. The DRI-FR has a live scaling feature to greatly simplify configuration. The high and low input ranges are stored in non-volatile memory and correspond to the high and low output range which is selected via DIP switches. Any 2 Hz range from 0 to 10,000 Hz can be converted to a full scale output signal (e.g. 0 to 2 Hz/4 to 20 mA or 9998 to 10,000 Hz/4 to 20 mA). Nota: An ACPB power rail is required to power the modules and is ordered separately.